One of my favorite art forms is blown glass. 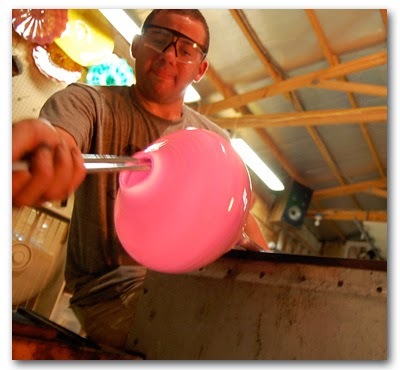 When we lived in New England for a few years, one of my favorite things to do was to go to one of the many glass blowing studios in Vermont or New Hampshire and watch the glass blowers work. I was fascinated by the process. The glass is melted multiple times in different types of furnaces to about 2500 degrees Fahrenheit. Then, once the glass is completely melted, the work of molding the glass begins. Before the glass can be turned into beautiful art it has to get incredibly hot to the point of being molten. Without the fire of the furnace, the artist would not be able to do their work. At the time I never thought about the spiritual parallels between the process of glass blowing and the sanctification process we all go through as Christians. I was in my 20s at the time and honestly I’d been through some small fires in my life but the “furnace” hadn’t really been turned up yet. The past couple of years God has shown me through some really hard times that in order to do His beautiful work in me; He was going to have to allow the heat to be turned up a little in the furnace of my life. The Refiner’s fire is a common theme in scripture. It’s interesting that the fire is described as a refiner’s fire, not an incinerator’s fire or a forest fire for example. A forest fire destroys everything in its path. The incinerator’s fire completely destroys an object. A refiner’s fire does not destroy or consume; it purifies. Just like the goal of the glass blower’s furnace isn’t to destroy the glass, but to melt it; the fires God allows us to enter into don’t consume us but instead refine and purify us. This theme is also discussed in the New Testament. Life is hard. We are “grieved by various trials” and Peter says the goal of these trials is to test the authenticity of our faith. We say we believe in God. We say we trust Him. We say that we give Him all control. But, do we really? When the fire starts to burn how authenticate is our faith? How real is it? Do we just believe in God or do we BELIEVE He is who He says He is? Peter also says something that brings me so much hope- our faith that has been tested and found genuine is precious. The glass blower’s furnace turns melted glass into beautiful art and our Refiner’s fire purifies us and makes us more precious than silver or gold.